Just when I thought the yarn store would be a safe place to take my son without being bombarded with “I want …, I want …,” we go in and find an adorable new yarn and plushy combo! Fortunately for him it was so darn cute that I couldn’t resist saying yes and coming up with a fun project to make with it. 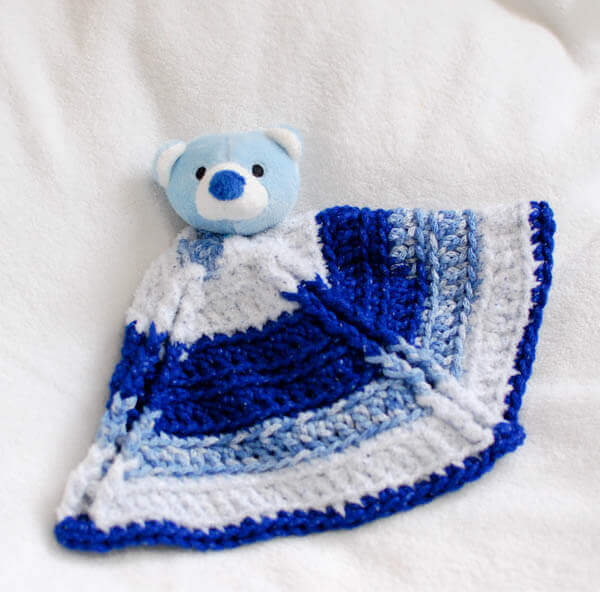 This sweet lovey works up in no time at all and is perfect for your little one to snuggle with at night. 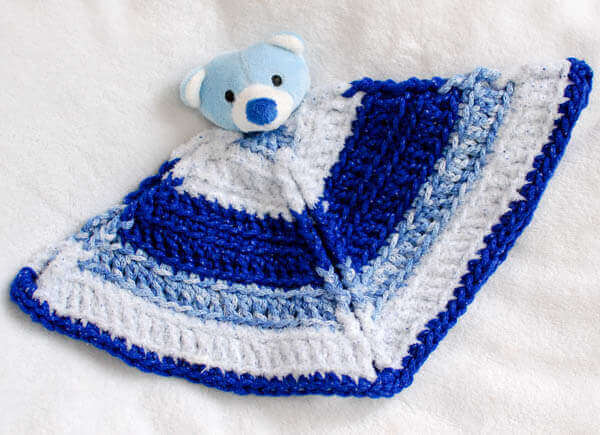 Try out this free crochet lovey pattern to make your own or give as a gift! Finished lovey measures approximately 12 in. × 12 in. 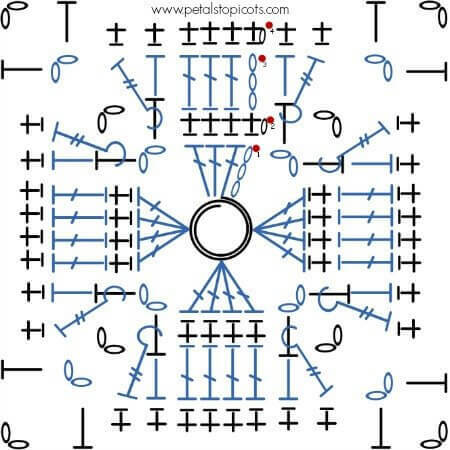 Round 1: Ch 3 (counts as dc here and throughout), work 3 dc in ring, ch 2, *4 dc in ring, ch 2, repeat from * twice more, join — 16 sts and 4 ch-2 corners. Round 2: Ch 1 (does not count as st here and throughout), working in back loops of sts only here and throughout the rest of the pattern, work 1 sc in same st as join and next 3 sts, [1 hdc, ch 2, 1 hdc] in ch-2 sp, *1 sc in next 4 sts, [1 hdc, ch 2, 1 hdc] in ch-2 sp, repeat from * twice more, join — 24 sts and 4 ch-2 corners. Round 3: Ch 3, work 1 dc in next 3 sts, 1 hdc in next, 1 FPtr around post of the same st in which the previous hdc was worked, ch 2, 1 FPtr around post of the next st, 1 hdc in same st around which FPst was worked, *1 dc in next 4 sts, 1 hdc in next, 1 FPtr around post of the same st in which the previous hdc was worked, ch 2, 1 FPtr around post of the next st, 1 hdc in same st around which FPst was worked, rep from * twice more — 32 sts and 4 ch-2 corners. Round 4: Ch 1, work 1 sc in same st as join and next 5 sts, [1 hdc, ch 2, 1 hdc] in ch-2 sp, *1 sc in next 8 sts, [1 hdc, ch 2, 1 hdc] in ch-2 sp, repeat from * twice more, 1 sc in last 2 sts, join — 40 sts and 4 ch-2 corners. Round 5: Ch 3, work 1 dc in next 5 sts, 1 hdc in next, 1 FPtr around post of the same st in which the previous hdc was worked, ch 2, 1 FPtr around post of the next st, 1 hdc in same st around which FPst was worked, *1 dc in next 8 sts, 1 hdc in next, 1 FPtr around post of the same st in which the previous hdc was worked, ch 2, 1 FPtr around post of the next st, 1 hdc in same st around which FPst was worked, rep from * twice more, 1 dc in last 2 sts, — 48 sts and 4 ch-2 corners. Round 6: Ch 1, work 1 sc in same st as join and next 7 sts, [1 hdc, ch 2, 1 hdc] in ch-2 sp, *1 sc in next 12 sts, [1 hdc, ch 2, 1 hdc] in ch-2 sp, repeat from * twice more, 1 sc in last 4 sts, join — 56 sts and 4 ch-2 corners. Round 7: Ch 3, work 1 dc in next 7 sts, 1 hdc in next, 1 FPtr around post of the same st in which the previous hdc was worked, ch 2, 1 FPtr around post of the next st, 1 hdc in same st around which FPst was worked, *1 dc in next 12 sts, 1 hdc in next, 1 FPtr around post of the same st in which the previous hdc was worked, ch 2, 1 FPtr around post of the next st, 1 hdc in same st around which FPst was worked, rep from * twice more, 1 dc in last 4 sts, — 64 sts and 4 ch-2 corners. Round 8: Ch 1, work 1 sc in same st as join and next 9 sts, [1 hdc, ch 2, 1 hdc] in ch-2 sp, *1 sc in next 16 sts, [1 hdc, ch 2, 1 hdc] in ch-2 sp, repeat from * twice more, 1 sc in last 6 sts, join — 72 sts and 4 ch-2 corners. Round 9: Ch 3, work 1 dc in next 9 sts, 1 hdc in next, 1 FPtr around post of the same st in which the previous hdc was worked, ch 2, 1 FPtr around post of the next st, 1 hdc in same st around which FPst was worked, *1 dc in next 16 sts, 1 hdc in next, 1 FPtr around post of the same st in which the previous hdc was worked, ch 2, 1 FPtr around post of the next st, 1 hdc in same st around which FPst was worked, rep from * twice more, 1 dc in last 6 sts, — 80 sts and 4 ch-2 corners. Round 10: Ch 1, work 1 sc in same st as join and next 11 sts, [1 hdc, ch 2, 1 hdc] in ch-2 sp, *1 sc in next 20 sts, [1 hdc, ch 2, 1 hdc] in ch-2 sp, repeat from * twice more, 1 sc in last 8 sts, join — 88 sts and 4 ch-2 corners. Round 11: Ch 3, work 1 dc in next 11 sts, 1 hdc in next, 1 FPtr around post of the same st in which the previous hdc was worked, ch 2, 1 FPtr around post of the next st, 1 hdc in same st around which FPst was worked, *1 dc in next 20 sts, 1 hdc in next, 1 FPtr around post of the same st in which the previous hdc was worked, ch 2, 1 FPtr around post of the next st, 1 hdc in same st around which FPst was worked, rep from * twice more, 1 dc in last 8 sts, — 96 sts and 4 ch-2 corners. Round 12: Ch 1, work 1 sc in same st as join and next 13 sts, 3 sc in ch-2 sp, *1 sc in next 24 sts, 3 sc in ch-2 sp, repeat from * twice more, 1 sc in last 10 sts, join — 108 sts. With a yarn needle, attach animal head to center of square by weaving ribbons on the head through the center of the square. Weave each ribbon in a separate direction through a few stitches and knot ends together to secure. Snip ribbon ends short enough to be hidden but long enough to unknot for washing. 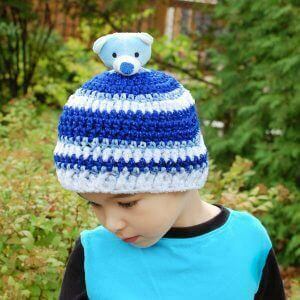 If you liked this pattern, you may also like my free bear child’s hat pattern here. These are so adorable. Clicked on the link – so many choices! 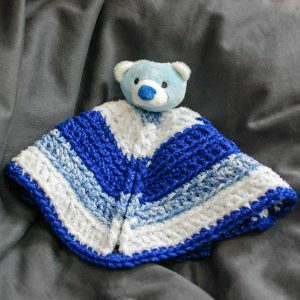 I have to do one for a baby due in February. I am going to have to come back after Christmas and buy a few. Prices are very reasonable. And your pattern is so good. I have made both the lovey and the hat. They came out so good that they are now on display at our local yarn shop giving you credit for designing them. I love him so much! He’s precious!